For those who work in B2B tech or consumer public relations, the next couple of days may not be spent pitching media stories about software or healthy snacks. It’s our hunch that no matter what the beat, journalists will be sticking to pre-and post-election coverage for a while. 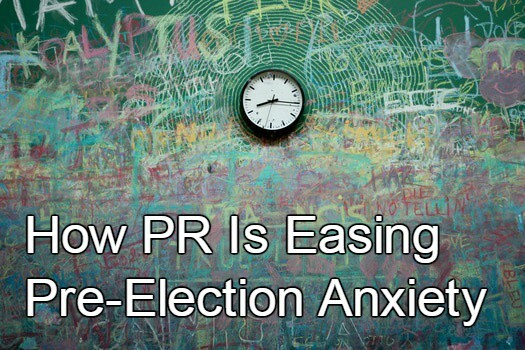 The 2016 election has caused angst for just about anyone, from bankers to schoolteachers, but PR people have a particular challenge because we spend so much time trying to get our clients’ stories in the news. In the spirit of endless polling, we decided to query friends at other PR agencies to see what they’re doing to relieve the anxiety for the next 24 hours. Here are some of the best tips. Can your clients be part of the story? Even if you don’t represent any personality, product or service related to politics, there are ways to enter the conversation. Think about angles for post-election stories where your client has a particular POV or is in an industry that the new administration policies will touch. That’s nearly every industry. Some can help in a bipartisan way; in Philly, Uber and Lyft are offering free rides to the polls. Announce your not-so-good news. Tepid earnings? Time to quietly pull back on a mediocre product? Now would be an excellent time to dump an announcement. No one will notice. Distraction, distraction, distraction. If the election is just too controversial for newsjacking (as is the case for most clients), consider this – what business task have you been putting off? Updating client plans, advising on 2017 CEO predictions, or simply ordering gifts for industry BFFS — why not do them now. It beats watching the same news over and over again with nothing really changing. Reach out to former clients and colleagues. Always a good end-of-year activity, but now might just be a good time to re-connect in general. As a colleague said to me,”with all the election discord, a friendly hello is really welcome.” Just don’t mention anything political. Like minds think alike. The exception to the rule above. If you are confident that clients, media friends and others share your views, send something congenial to rally everyone’s spirits and try to mitigate the stress. Nothing feels better during divisive times than messages that show we are all in this together. We are fond of this Snapchat pantsuit filter ourselves. Take a break. If you’ve just been too disgusted to read your newsfeed or any election coverage of late, you’re not alone. There are reports that for some, the exhaustive media coverage is taking its toll physically. So, consider taking a walk, reading some good gossip or just chatting with a friend about anything other than politics. Get immersed in the issues. If you absolutely can’t tear yourself away from the coverage, at least be smart about it and get some of the fairest, most insightful, least biased reporting – watching election night returns with the sound off, or tuning into C-SPAN.